Bariatric rollators, also referred to as heavy duty rollators, are meant for larger users who can’t fit into standard size rollators or find them uncomfortable. Many standard rollators have a 400 pound or less limit. Fortunately, there are several heavy-duty rollators to choose from today. With health problems or old age, it’s difficult enough to keep your balance without worrying about supporting your own weight. 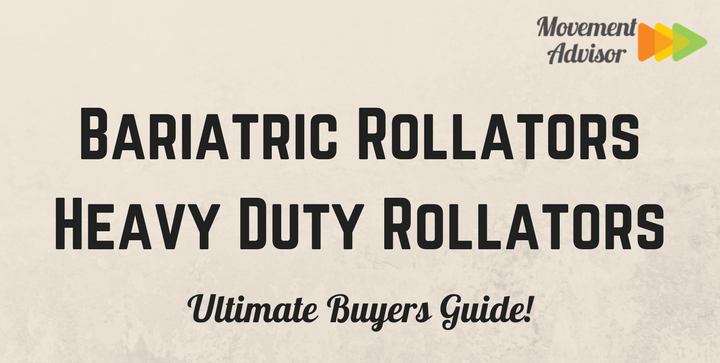 Bariatric rollators typically have a weight capacity range from 400 to 600 pounds, but some professional grade products can support weight over 750 pounds. Before you purchase a bariatric rollator, you should do some basic measurements to make sure you choose a product that fits you comfortably. The height of the walker, particularly the handles, is probably the most important measurement you’ll take. To get an accurate measure of your ideal handle height, stand with you arms hanging loosely at your sides. It’s a good idea to put on your usual walking shoes if you plan to use your rollator outdoors. Measure from your wrists to the ground. This distance should be at a comfortable height for you to grip handles. Since bariatric rollators all come with seats, you’ll also need to think about the height of that seat. This measurement is easy to take. Choose a chair that you can comfortably get in and out of and measure the distance from the seat to the ground. The resulting number will be your ideal seat height. Sitting on a seat that’s far too small is uncomfortable and not good for your body. Take note of the seat dimensions while you’re shopping for a bariatric rollator. If you’re unsure of a good size, you can compare against chairs you have at home. Measure the length and width of a comfortable chair to make a good comparison. Bariatric walkers are wider than average, allowing for a more comfortable fit. Although most should give you the room you need, you can easily check the width before purchasing. Some bariatric rollators don’t fit through all doorframes, so it’s a good idea to check the doorframes in your home and determine whether you need to stick with a smaller width. Another option is to seek out a rollator that’s easy to fold and move through doorways when compact. Most rollators allow you to adjust the handle height for comfort and customization. Some also allow you to change the seat height. Make sure the range of adjustment falls within your required height. There are also several options when it comes to the rollator seat. In addition to varying sizes, the seat can be padded or cushioned. Some have an ergonomic design to support posture and back health. Backrests are also a common feature. Check to see the backrest is easily foldable or removable if you know you’ll need to travel with your rollator. The size of your wheels may not seem very important, but they can make a big difference in your experience. Large wheels provide a stable ride, while small wheels can easily become stuck in cracks or rocky ground. Look for wheels that are 8 inches wide or larger. It’s also good to use wheels with reinforced spokes and forks, which strengthens the wheels and allows them to bear greater weight. Medline’s Bariatric Aluminum Rollator supports up to 400 pounds, and it’s lighter than most models at only 19 pounds. It has a wider distance between the handles for those who want or need more room. This rollator has a padded seat that measures 17.5 by 14 inches. Underneath the seat, you’ll find a basket to store your personal belongings. The wheels are 8 inches across and are reinforced with extra spokes and forks so they can hold more weight. The whole walker is foldable and is easy to store. Its dimensions are 29 inches wide and 29 inches long, with a height of up to 44.5 inches. Be aware that it might not fit through all doorways. Another bariatric rollator from Medline, this model uses a frame of reinforced steel for greater support and durability. It can support 500 pounds, and the product weighs 26.7 pounds. The comfortable seat is 17.5 by 14 inches and includes a backrest. This model also has a velcro pocket under the seat. The 8-inch wheels have reinforced spokes and forks to keep the product sturdy. It uses loop brakes that are easy to control for safe use. The overall dimensions of this Medline rollator are 29 inches wide, 29 inches long, and 44.5 inches high. The manufacturer cautions that this 29-inch width might not fit through all standard doorways. The width between the handles is 23.5 inches, perfect for people who need to have more room. 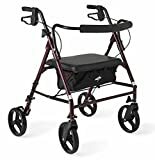 The height of the walker handles are adjustable and range between 31.5 to 37.5 inches. The seat height is set at 22 inches. Easy to use locking handbrakes designed for maximum comfort and control. Comes with a removable front wire basket (16.5"W x 10"L x 6"D).Width Between Handles:23.5″. Nova Medical Product’s Mighty Mack is a truly heavy duty product. It can support up to 600 pounds. 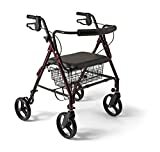 This strong and durable walker weighs 24 pounds and is suitable for both indoor and outdoor use. Its large wheels are 8 inches and cover most terrain easily. It features hand brakes that are easy to lock and control. The whole rollator is foldable and has a unique Lock n’ Load system that helps keep the walker secure during transport. Storage comes in the form of a front wire basket that’s removable. The seat is designed for comfort, with a large molded seat and a removable rubber pad. The seat size is 13.25 by 19.25 inches, while its height is 21.5 inches. You can purchase the Mighty Mack in red and blue. Its overall size is 27.75 inches wide and 25.75 inches long. The handles are height adjustable at a range of 30.25 to 36 inches high. 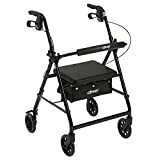 This rollator is recommended for users from around 5’5″ to 6’0″ tall. The Drive Medical Bariatric Walker has a weight capacity up to 500 pounds. This product is available in red or blue. It has a large basket that attaches under the seat. The soft, padded seat is 13 inches long by 18 inches wide. The seat height is set at 22 inches. When you take a break, you can also enjoy a padded backrest, or remove it easily without tools. The soft grip tires have 8-inch casters and function well both in and outdoors. A loop lock with internal aluminum casting keeps you secure and allows for easy control of the walker. Drive Medical’s Bariatric Walker measures 30.5 inches wide by 26.75 long, with a minimum 35.25 inches high. You can adjust the handle height from 35.25 to 39.5 inches. SAFELY, EASILY, AND COMFORTABLY INCREASE MOBILITY with large 8 inch rubber wheels, simple and ergonomical bicycle style breaks, with an extra wide cushioned seat and a frame that folds and stows easily. FSA eligible. EXTRA WIDE ROLLATOR WALKER WITH REMOVABLE STORAGE BASKET improves balance, stability, and convenience. 29.5 inches wide, with a width between the handles at 22 inches. MADE OF STRONG, LIGHT WEIGHT ALUMINUM, in 3 attractive colors, making it sturdy for up to 375 pounds. Easy to lift and manuever at only 21 pounds. EASY TO ASSEMBLE WITH NO TOOLS NEEDED. Have your rollator walker on the move in minutes. The Duro-Med Extra Wide Rollator is a little weaker with a 375-pound weight capacity. It weighs only 21 pounds but still has extra wide dimensions to increase your balance and stability comfortably. This product is made of aluminum, so it’s both durable and lightweight. The Duro-Med rollator is available in three colors: burgundy, royal blue, and titanium. It uses 8-inch rubber wheels for a strong grip. Ergonomic hand grips and handbrakes make this walker easy to use. The seat is extra wide and cushioned, while the whole walker is foldable and easy to store. It features a removable storage basket. You won’t need any tools when assembling this rollator. The overall product is 29.5 inches wide, with a comfortable 22-inch distance between the handles.